By reading my last post, some readers may assume that I don’t believe a real adjunct walkout could or should happen. My point regarding Adjunct Walkout Day in my last entry was that it is both simplistic and defeatist to assume one can simply pull off a walkout without considering all that would be involved. Unlike the Women’s marches which “benefited” from the fact that just a day earlier, the most divisive, bigoted and bombastic politician in recent memory was assuming the highest office in the land despite losing the popular vote by 2.9 million votes, adjunct actions are limited by the fact that adjunctification is largely treated as the dirty little secret of academia, with the workforce highly marginalized, and under the constant threat of loss of employment for even minor infractions. Further, there are so many forms of adjuntification/contingency that it can at time be that adjunct/contingent groups fighting for change can find themselves at cross purposes. Another point to make is that the Women’s march is literally the start of a broad-based movement, which will in time face challenges from division, to marginalization, to a loss of enthusiasm, etc. That said, the Women’s March should serve as an inspiration for adjunct to think in terms of mass action. To achieve a mass walkout of adjuncts, even on a local scale, there must be a both a common sense of alienation coupled with an equally strong sense of moral outrage. I think to an extent, this is there, but there isn’t this common sense of what to do. Second, and perhaps more importantly, adjuncts are fearful of reprisals from loss of employment to punitive scheduling, to even a simple reprimand. As so many adjuncts are effectively just “hanging on” in terms of income because these reprisals could lead to the loss of their homes, impacting not just themselves, but their families. Further, because unions can’t legally call for or advocate strikes unless they have exhausted negotiations with a particular management group and not only declared impasse, but held a strike vote in which the majority of the membership authorized a strike, the union cannot protect workers who participate in a walkout, nor can it officially call for one. But this doesn’t mean a walkout couldn’t happen. Here’s when any adjunct who might be thinking of a walkout needs to read their contact carefully. Most adjuncts have, as a part of their language, a sick leave policy granting them time away from work. In many cases, the taking of sick leave, if for a very short period of time, does not require a doctor’s note. This effectively means that you could leave or miss work without reprisal (with the assumption that you’re sick). Imagine, if you will, a day in which even 50% of an adjunct teaching force suddenly got ill.
On January 11th, 2016, frustrated with the dilapidated conditions of the facilities they were teaching in school teachers in the Detroit Public System staged a sickout which garnered national attention. This action was followed up by a sick-out in early May which ultimately resulted in pay guarantees for its teachers. Perhaps what the adjunct/contingent nation needs to do is consider this as an option. 1) There has to be buy-in: There is, at any school, or district, a dedicated core of individuals who are willing to take the risk, and after them perhaps double the number who will talk a good game, or show interest, but then not act, and often, both groups combined, at best, represent only 10% of the adjunct faculty. To get larger participation, there needs to be either a greater sense of outrage or injustice, and perhaps more importantly, a sense that by doing the action it will actually accomplish something. 3) There need to be allies among students, politicians, and the general public: Given the current lack of awareness among students of who or what adjunct/contingent faculty really are, and how adjunct/contingent working conditions hinder student success, there’s a considerable amount of awareness raising that needs to go on. Personally, I’ve seen awareness and consciousness rise among students, but not enough so that there is widespread concern among student groups. There has to come a day when you can ask students in a given class, “Do you know what an adjunct is?” and have more than 50% of the class actually know and have a strong opinion about it. Again, this gets back to the fact that adjunct/contingent faculty by and large avoid explaining who they are to their students. As people in the business of attacking ignorance, it’s so ironic how many adjuncts contribute to it when it comes to the fact of being adjunct. Politicians are not much different, and in fact, a bit worse. Since the Reagan administration, teachers have been one of America’s favorite whipping horses as to the ills of American society, and the college professor is still by and large perceived as some sort of upper-middle class elite who drives a nice sensible car and looks down on less-educated Americans. Further, we’re “impractical,” “we don’t know the “real world.” On the other hand, when it is acknowledged that many of us are financially struggling and live with employment insecurity, we are told by these same politicians, that it’s simply the market economy (even though many of us have full and overflowing classes), or that if we don’t like it, we should just quit, as if the 50+ year-old adjunct with an advanced degree is some sort of versatile property that can pick up a job a will. Further, this is not a Republican or Democrat thing. In fact, some Democrats have been even worse in their embrace of the Corporatization of Public Education. They often call for “school choice,” “charter school,” or speak of free Public Higher Ed (itself a worthy goal) but not a lick about improving the working conditions of the people who deliver that education. There are politicians who do get it, like California State Assemblyman Jose Medina, but we need to bring these people up, and some of us need to run for office ourselves. Adjunct and Contingents, as for the general public, how many of you talk about the work and salary conditions you experience among friends and neighbors? By the way, when was the last time you saw an adjunct represented on TV or in a movie, and moreover, was there any mention of their lack of income, job security, or how students were affected by this? News stories on NPR, MSNBC, or the Nightly News aren’t going to be enough. We have to create a culture and have a presence in media where by our situation is known. 4) We need full-time allies who will stand with us: An adjunct walkout can work if full-time support is there, but we need to have support that is significant. Maybe they need to walk out with us, or stand up to administrators who will seek to sanction by simply leaving us off the schedule the following semester. It would also be nice if they weren’t afraid of us “taking over,” which is something I hear more often than I would like. I will say this, unless a concerted effort is made to de-incentivize the hiring of adjunct/contingent faculty, the tenure system will collapse, and for any adjunct foolish enough to think this would be a good thing, think again: it would effectively mean an end to academic freedom. Then you can face the risk of getting fired without cause, or for showing your student a film about income inequality or racism that they’re not down with. Adjuncts need to fight and stand for full-time positions, but at the same time full-timers need to realize that pay and benefit equity for adjuncts is the price for protecting tenure. 5) Any kind of sickout has to be a mass movement of leaders in smaller groups or cells, not something directed by a singular group of activists: As I already stated, union leaders by and large have their hands tied in calling for or directing such actions. Even smaller activist organizations with visible leadership need to be aware that without mass support and protection, they face retaliation, which is fine if they’re willing to carry the costs of losing their jobs or careers, and subsequently labeled a martyr or symbol for the cause. Some people can do this, and we can applaud them for their sacrifice. For others, mass action can provide both the support and anonymity to act. The idea of a sickout can be spread through word of mouth, and when consensus is realized then people can act. 6) We need the support of those adjuncts who can’t, for whatever reason, join the sickout, and we need to support them: Any kind of strong labor action is a scary thing. For many adjunct/contingents living from paycheck-to-paycheck, and even then not making it, such an action is frightening. Some adjuncts feel bound to their students (though a sickout can very much be a teachable moment). These are our brothers and sisters, and they can stand with us, speaking out as to why have chosen to act. They can share in the communication of our grievances and our demands for redress. If we know that they understand our actions and stand with us otherwise, then we must embrace them. And there you have it. This is what it’s going to take to have the walkout/sickout/whatever . I personally don’t see it happening in the immediate future, but then again, I didn’t think I would see millions of people in the street the day after Trump’s inauguration. I for one would love to be pleasantly surprised, but I’m just one person, and by writing this, I am excusing myself from leading this, but not from potentially participating. For any adjunct/contingent who’s read this, I have now put the onus of leading or participating in such action upon you. It’s time for you to talk, and act, and plan. The adjunct crisis is the higher education crisis. In other words, the eclipse of the humanities by STEM, the prevalence of administrative and accreditation scandals, and the specter of “accountability” coming to higher education, are all the result of adjunctification. We are not prepared to resist the onslaught of privatization. There is a division within our union ranks not of our own design, which we do not clearly see. And this is troubling. We are divided. 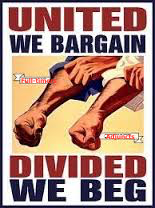 Our union is divided. As long as we accept that the interests of adjuncts and contract faculty are different, as long as we conceive of them as distinct bargaining groups, we will perpetuate this division, this two-tiered system. It is not an accident, I think, that tenure has been under attack in the courts recently, at just this point, a perfect storm. It is not an accident that the ACCJC tried to shut down CCSF, the largest California community college full of adjuncts who are paid on an equity scale, as part of a scheme, I am convinced, to privatize the entire system. But ACCJC failed, in part, because of the unity of local 2121. I am also convinced that much of the solidarity of that local comes from the equity pay. It is one thing to recognize that adjuncts are essential; it’s another to be that recognition and establish equal pay. I realize there are plans to get funding from the governor, and that other plans have repeatedly been killed in one of the appropriation’s committees. But these don’t seem to be working. When will elected representatives see the light? When will the governor be so generous? Which governor will be so generous? How many drops in the bucket before it’s full? We did not design this two-tiered system, but we perpetuate it in numerous ways. One way we perpetuate the ongoing exploitation of 75% of faculty is the unquestioned acceptance of the system. I am aware, of course, having participated now for a couple of years in a campaign to petition California’s Governor Jerry Brown to fund equal pay categorical items in the state budget, as well as efforts to publicize the adjunctification of higher education which have been nationwide even, that we are, in this way, “questioning” the system, and trying to change it. Personally, I’m not sure what else we could do at the state level than what we are already doing. Probably, there is more that we could do at the state level. But my opinion is that we could do more at the local and personal levels. And increased activism and participation might just trickle up to the state level. For one thing, locally, we can participate more fully in AFT sponsored Campus Equity Week (CEW) and National Adjunct Walkout Day (NAWD) events. Rather than a ragtag group of adjuncts trying to pull off major events, which has been the case in our recent efforts at Local 1931, we could have the whole force of our union, tenure-track, adjuncts, classified, each of us contributing in some small or large way to the cause, which is, after all, resistance to the corporatization of higher education. We could take these nationally recognized days of protest seriously as some of the most important events of the year for our union. We could have a show of numbers, of full-timer and part-timer political action, staging multiple events across campuses: teach-ins, rallies, poetry readings. guerrilla theater, music, movies, pizza. We could engage students in protest. Another thing we could do at the personal level is to realize that the two-tiered system is the first part of the “management” strategy to “divide and conquer.” We are divided, clearly. Will we see the “conquer” stage before it happens? Was the ACCJC plot to privatize, effectively, CCSF an attempt to begin the stage of conquering? In our last round of negotiations, because of our unique Resource Allocation Formula, which gives the union a prescribed portion of state funding, we were able to provide adjuncts with an 8% raise, while full-timers took only a 5% raise. This was in the right spirit, but I’m not sure if we can really count on ever achieving equal pay if we only gain 3% each round. We need more. We need a plan to establish equal pay for adjunct faculty, with a timeline. The plan can and should be multi-pronged, focused on state-level efforts as well as local efforts. In order to make a plan, I think we will need a paradigmatic shift in the way we see ourselves If the interest of full-time faculty is to save higher education as a public good, including tenure as well as a wide-ranging curriculum, equal pay for adjuncts is the first step toward a strong union of financially secure members. Financial security would empower adjuncts to get off the freeway and focus more on activism; it would invigorate our union. The adjunctification of higher education is not an accident of market forces. It is an intentional, ideological scheme to render a public good a private luxury. We must see resistance to adjunctification as our most important battle if we hope to reclaim the promise of higher education in America. To have real unity, we need real equality. Adjuncts need equal pay. For those of you who follow this blog, you know that, at least in California, myself and John Hoskins, along with many others in San Diego, were heavily involved with events regarding National Adjunct Action Day (I also referred to it as the “whatever”) last year. We put a lot of effort not only in the planning of events (there were six separate rallies in San Diego County alone). Planning these events was not simply about having a few meetings, pulling out a card table, getting a microphone and making a poster. It involved 1) looking at specific actionable items, 2) securing facilities and equipment (which will take several weeks of advance planning, 3) arranging for higher profile speakers, 4) Coordinating with students and outside labor/social justice groups, 5) putting together literature, 6) Publicizing the event, 7) Organizing adjuncts and students to work tables, 8) Presenting before college governing boards, and trust me, I could go on. We started planning for this year’s events on 2/26/2015, which is approximately one day after National Adjunct Action Day, which was 2/25/2015. In keeping with the idea that this was a “day of action,” I stated on this blog that we were looking for marking National Adjunct Day on Wednesday, Feb. 24th, 2015 which would be the fourth Wednesday in February, effectively commemorating National Adjunct Day. We of course imagined that there would be various activities leading up to the day, but weren’t looking at designating this as a week. The reason for this is that both the CTA and CFT, the two major unions in California, already have “Campus Equity Week” which runs during the last week in October. In fairness, while this used to be a biannual event, it is now in fact an annual event, and works well for us in terms of pressuring the state legislature, which controls our funding, and in addition, help us “rally the troops” for Election Day the following week. After running a week of these events, as we did in San Diego, we can’t really run another full week of events because we end up appearing redundant and burning out some activists. The idea of a “day of action” is to concentrate our efforts into a series of mass actions which will have the most impact, and perhaps draw media attention. In the San Diego and Southwestern Community College Districts, the first day of instruction for the Spring Term is February 1st. To effectively arrange facilities and organize our actions requires at least three weeks, and while some prior planning can be done, it’s extremely hard to organize during the break except at the basic planning stage because so many people “check out” during break. Recently, a group I assume that is affiliated with Brandeis University put out on social media that a National Adjunct Week of Action would be taking place from Feb. 15th-20th. It would have been nice if they had actually talked with people like myself, who actually organize this stuff, because I would have them that we had prior plans, and that the timeline doesn’t work for us. In addition, to what I stated before, Feb 12th -15th is actually a four-day holiday weekend in our districts, which is another problem in itself. By the way, I spent a bit of time on the net looking for discussions of a National Adjunct Action Day for 2016 in November right after Campus Equity Week. I saw nothing, so we assumed that we had to act, and we have. To the people planning events on the 15th-20th, I’m glad you’re doing something and I sincerely wish you well, but I’m telling my good adjuncts in the San Diego area we’re looking at Wednesday Feb. 24th. If we truly want to take the National Adjunct “Whatever” a unifying and effective event, then after this year’s activities, let’s have all the main groups coordinate and lest come up with a time window that works for everybody. I am happy to be reached through the blog, or via my email, which is mixinminao@gmail.com. However, I will say this, if you feel the need to speak to, and act out on adjunct issues, don’t let it being a specific day stop you—get out there and do something whenever. The adjunct nation needs you!